WPMobile.App help you to synchronize your WordPress content to your new application but keep in mind that your application should not just display your site as in a web browser, the user experience must be different. Most important part of the app customization: use widgets and customize the app interface. Learn how to use widgets and app blocks. Use a PNG logo of 512x512 pixels. Do not use a stretched logo or a small image, the render will be of poor quality. The logo is the first experience with your app, take your time and check everything twice. The best size for the splashscreen is 600x900. The safe area to put text must not exceed 1/2 of the width and 2/3 of the height. Don't be too marketing oriented, describe the app as you would verbally with a friend. What is the content available on the app? Why your app is useful? What can your users do on the app? 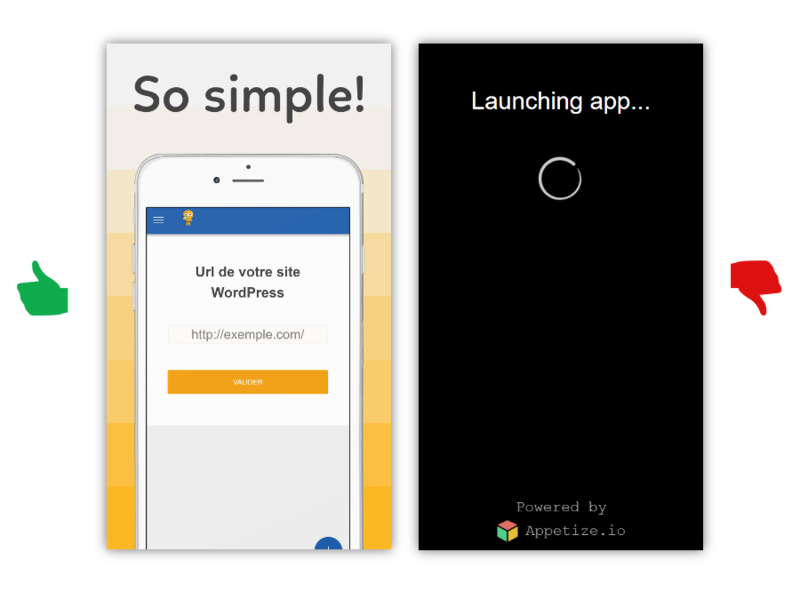 Preview of your app is essential. With your order you get 1 screenshot/device. This is just the homepage and it's much better if you add more screenshot of the app in action. You can use our screenshot generator and a service like placeit to enhanced your screenshots. Be sure to upload valid image size.